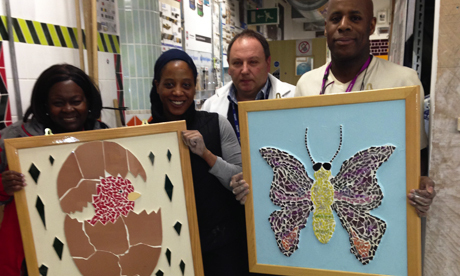 Two new mosaics made by a pair of Hackney Community College students are to go on display in the capital’s prestigious City Hall. The students, Emerald Skerrett and Derek Jackson, presented their work to Chair of the London Assembly, Jennette Arnold OBE, after she visited their Shoreditch Campus last week. One of the mosaics is a colourful butterfly while the other is an image of a chick in an egg. “The students can start to make a living – and it’s a great skill to have,” she added. Ms Arnold had previously met several other crafts enthusiasts from Hackney Community College after tiling student Valerie Antoine won a gold medal for her work at the Olympic Skills Showcase. Ms Arnold was so impressed with her creative interpretation of a swimmer diving into a pool that she also had it put up in City Hall – where it is soon to be joined by the two new pieces. The opportunity to have work displayed in such a grand setting is one that Derek Jackson said he will use in his future career. “It’s a skill I’m very proud of acknowledging,” he added.